The Zwilling J.A. Henckels Aurora stainless steel 9.5 inch fry pan is an ideal size for a fry pan when you're cooking a few eggs, chops or chicken pieces. The Aurora skillet from Zwilling J.A. Henckels has a fast, even-heating 18/10 stainless steel cooking surface. 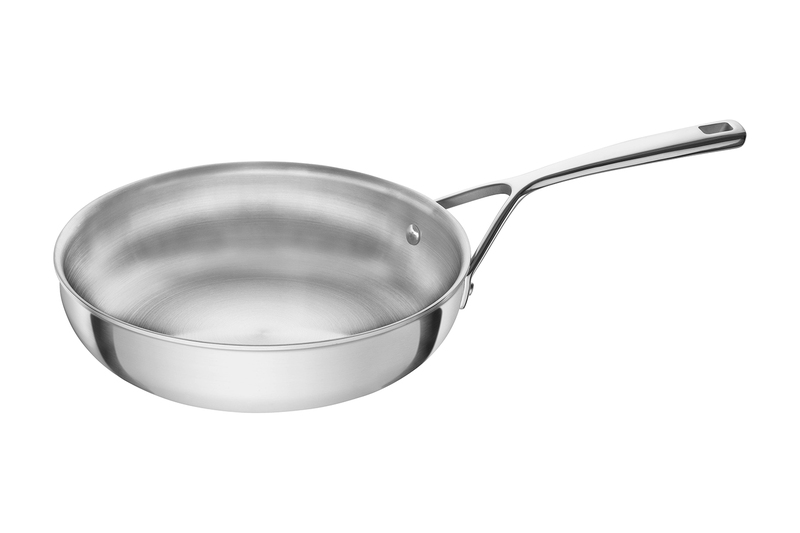 The fry pan is made with 2 layers of stainless steel which fully encapsulate 3 layers of fast heating aluminum. Comfortable stainless steel handles stay cool while you're cooking. The flared edge on the Aurora fry pan also helps to minimize drips! Put it into your dishwasher for easy cleaning or hand wash and dry it to maintain the beautiful appearance of this pan for longer. Zwilling J.A. Henckels Aurora cookware is made in Belgium and includes a lifetime warranty with normal use and proper care. This Zwilling J.A. Henckels Aurora looks beautiful and is made with care in Belgium. Heats up quickly and evenly thanks to its 5-layer stainless steel and aluminum construction. The core is made from 3 layers of aluminum fully enrobed, exterior and interior, with stainless steel. For the best cooking performance, we recommend heating Zwilling J.A. Henckels Aurora cookware for 1-2 minutes prior to adding food. Use a low to medium heat setting.